When most people suffer from stroke, it interferes with the vital neural connections between your brain and muscles. 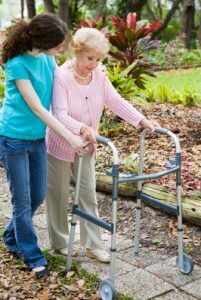 This leads to some disability which leads to problems in mobility and movement. Due to the advancements in physical therapy, this disability is not necessarily permanent. In fact, rehabilitation is crucial during the early stages of recovery. The physical therapy regimen offered at New Beginning Physical Therapy has been proven to help stroke patients on their road to recovery. When the time comes for you to go home, New Beginning Physical Therapy will provide a physical therapist to care for you throughout your recovery and in-home physical therapy. Home physical therapy will ensure your successful treatment as the exercises offered will give you benefits such as stimulating and strengthening affected muscles while also exercising your healthy brain tissue. The physical therapists at New Beginning Physical Therapy will offer professional and efficient treatment specifically tailored to help your stroke recovery. As much as the service is very professional, your physical therapist will be friendly with you, keeping you mentally calm. The home physical therapy for stroke regimen offered by our center is aimed at ensuring you receive the best, quality treatment in the region. Leg Exercises – these will be tailored to help you regain movement in the affected leg. Most of these exercises will be done while sitting. Core Exercises – the physical therapist from New Beginning Physical therapy will help you exercise your core as this is the leading method to recover your posture. Arm and Shoulder Exercises – these exercises will help you work out the affected side and restore normal arm and shoulder functionality. Be sure to visit us at New Beginning Physical Therapy, Palm Desert, CA for more on home physical therapy for stroke.